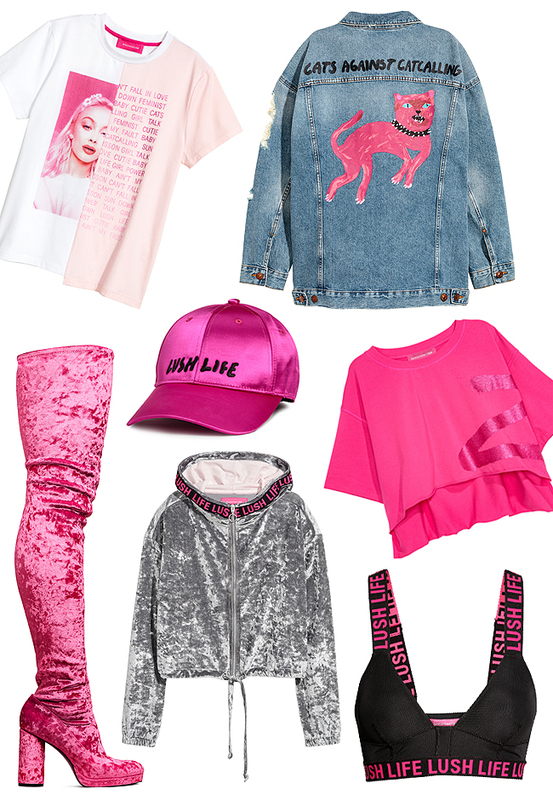 Mark the 18th May in your agenda: H&M is launching a capsule collection with Swedish pop singer Zara Larsson, and it's a dream in pink and velour screaming girl power. If the Spice Girls would hit the stage for the first time tomorrow, I can imagine this is what they would wear! Zara Larsson's pieces reflect her personal style and are emblazoned with hot print graphics as well as feminist messages. The mix of edgy streetwear with strong graphics and glamorous stagewear makes every girl's heart beat faster. The 19-year-old platinum-selling singer Zara Larsson is known for her playful and empowering songs. After winning the Swedish version of Got Talent in 2008, she gained fame, first national and then international. Her new album "So good" will be released on the 17th May. Zara Larsson calls herself a feminist and her favourite colour is (naturally) pink. She is looking forward to girls all over the world adding her clothes to their personal style. The collection will be available worldwide on the 18th May in selected stores and online. If you are in Switzerland: Head to Geneva or shop online. Credits: Courtesy of all pictures by H&M.